March finally quieted down after the historic run since Trump's election. The S&P 500 actually declined ever so slightly by 0.04%. So the markets didn't do much to help out my net worth. Nevertheless, those dividend payments of nearly $850 came in handy and actually accounted for nearly 100% of the net worth increase. For the month our net worth increased $866.65. 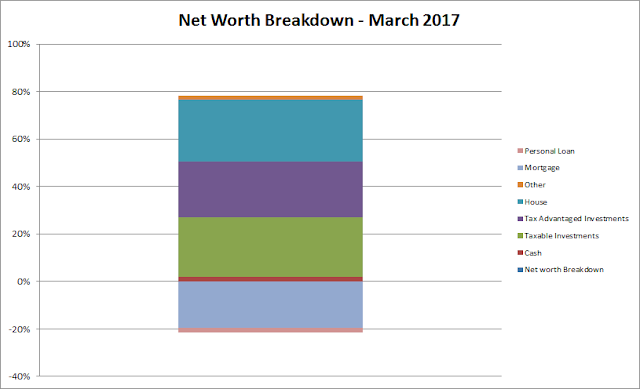 March wasn't quite as fruitful as February in terms of net worth improvement, but we're at least moving in the right direction. Despite a big start to March, the markets did a whole lot of nothing the rest of the month. With my income becoming fairly steady we should be able to start counteracting the blah months for the markets, but unfortunately most of my income will start to be funneled towards debt reduction. It's the right move in the long term, especially since the markets aren't exactly screaming value everywhere, and I can't wait to finally knock this out and get back to regular investing. As of now I'd ballpark the end of this year at the earliest before we can resume heavy investing of our free cash flow. Sigh. For the month our net worth increased 0.18% and YTD we've shown a gain of 1.18%. As of the end of March we have 24.6% equity in our house based on our purchase price from 2013. However, according to Zillow our house has increased in value $20k from our purchase price which is a nice bonus, although I keep the purchase price as the value in the net worth equations. Based on Zillow's estimate the equity in our house is 30.9% thanks to the appreciation. Since I write so much about investigating companies as an investment I figured it'd be fun to see how our balance sheet looks. As of the end of March our debt to equity ratio is 38% and our debt to total capitalization is 28%. Not bad, but I'd love to get that debt down to ZERO! Each month I like to examine the state of our non-work cash flow. Since our goal is to become financially independent that monthly cash flow has to come from somewhere in order to cover our expenses. Truly passive income, dividends and interest, totaled $843.91 during March which was a slight dip from December's $865.95. *Dividends are from my taxable accounts only. Adding in the EBIT earned from blogging/writing added another $494.66 to the monthly non-day job income total. Total non-day job income for March came to $1,338.57 which is a 28% increase from December. That's more like it! Including dividends, interest and blogging income we've generated $2,329.10 of additional income through March. We're 23% of the way towards our goal of $10k so we're just slightly behind the required pace. How did your net worth fare in March? 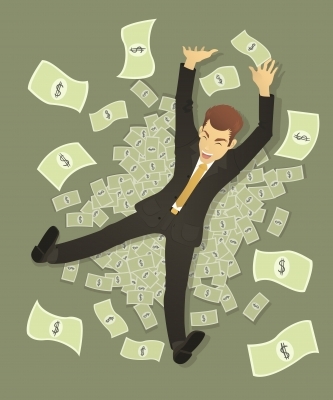 Did you have a similar lull with your net worth or did savings help propel you higher? Nice growth in your net-worth. I have not been tracking by net-worth, I might start soon. Thanks for sharing your journey with us. Well done! Wanna race to 1MM? Good job. I have most of mine figured out but lost the password to one account so I have to get that again. Very nicely done. I hope you can continue to grow that net worth over time. All the best.